March 1st was a big day for Taylor and I... it was our one year wedding anniversary! I can't believe it! In most ways, it's astonishing how this year has flown, but in other ways, Taylor and I were immediately so comfortable with married life that it feels like we've been married for a few years already. I have such a grateful heart for the blessing Taylor is in my life. I am so thankful for the strong, passionate man of God that he is, and for his patience towards all of my weirdness. I'm grateful to have someone who is constantly talking about God's word and combating the wrong thinking of the world. 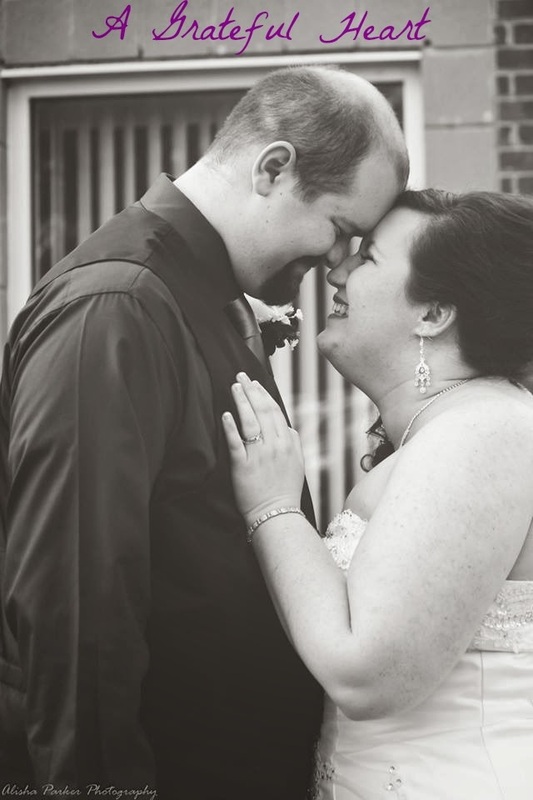 I'm grateful that our first year of marriage went so smoothly. We had our challenges, but for the most part, the first year was easy. God carried us through with a lot of grace. We learned to live together, learned to communicate in more detail (an essential part of daily married life), and learned a few hard lessons about ourselves. I'm grateful that despite our individual selfishness- our wants, our needs, our whining - God carried us through and he continually uses our marriage (and flaws) to shape and sharpen the two of us. I'm grateful that my husband's desire (as is mine) is to let our marriage be the gospel to the world. A marriage that shows the forgiveness, mercy and unconditional love of Christ is what we are called to and what the world needs to see. I'm thankful that, despite our brokenness, we both have that same goal, and we both belong to the God who wants that for us and will help us achieve it, for his own glory! This post is part of Ember Grey's "A Grateful Heart" link-up. Click the button at the top of this post to view the link-up! Anyone with a blog is welcome to write a Grateful Heart post and participate! What are you grateful for today? Is there anything you need to be more thankful for than you have been lately? Comment below! Wow this is so honorable! Your virtue shines through. Thank you so much, Holly! Yours does too in your blog! Kristin, I love this! My husband and celebrated our two year engagement anniversary (we actually got engaged in a Starbucks, but that's a story for another time ;) on March 2nd! SO many congratulations on your first year of marriage...it's a huge accomplishment! Thank you! Congratulations to you guys too! That's awesome!